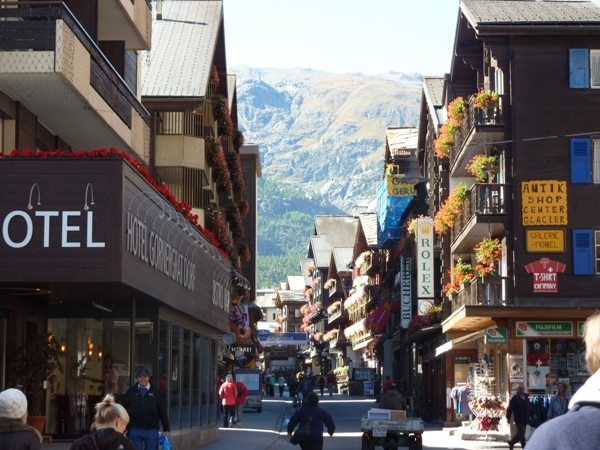 Zermatt: Winding, cobbled alleys lead visitors through the small, scenic village of Zermatt. Old, sturdy, wooden chalets line streets and lend a cozy feel to the car-free medieval village filled with pedestrians breathing in the fresh, alpine air. As pretty as this traditional Swiss village is, the visitor’s eye is drawn upward to the majestic peak of the famed Matterhorn, which soars up to 4,478 meters (14,692 feet). The Matterhorn is not the only peak in town, though. 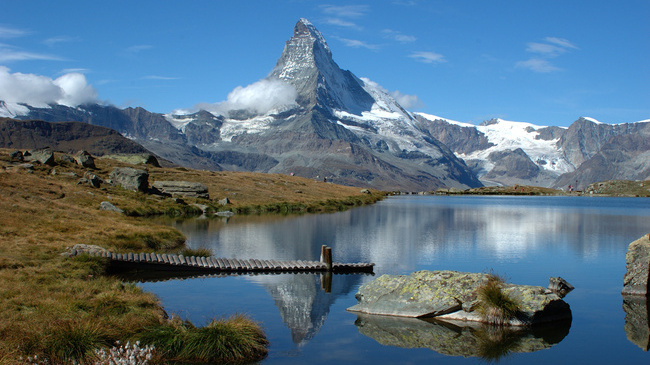 There are 29 mountains surrounding Zermatt that rise over 4,000 meters (13,200 feet). 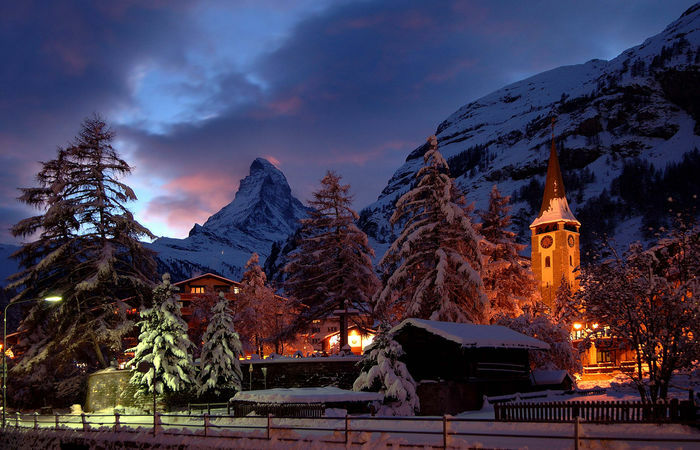 The Matterhorn Ski Paradise covers three ski areas: the Sunnegga-Rothorn, the Gornergrat, and the Klein Matterhorn. There are 250 kilometers (155 miles) of trails with 22 percent designated for beginners, 50 percent for intermediates, and 28 percent for advanced skiers. The intermediates have the advantage in Zermatt with miles of scenic runs but there is excellent off-trail skiing, as well as special heli-skiing trips for advanced skiers. Zermatt welcomes snowboarders as well. Boarders are allowed on most of the resort’s slopes and there are two snow parks with two half-pipes. There are also good schools for snowboarders including the Swiss Ski & Snowboarding School and the Stoked Snowboard School. The terrain for cross-country skiers is somewhat limited and is located near the bottom of the mountains and requires natural snowfall. However, skiers enjoy several loops and trails sheltered by trees. There are 30 kilometers (18 miles) of hiking trails. Snowshoers can follow these trails, as well. The trails provide magnificent views of the surrounding mountains including the Matterhorn and there are cozy huts along the way to warm up in. For hikers that prefer more of a challenge there are local guides available to lead the way. There are also other winter activities to enjoy in the area, including tobogganing, ice skating, and ice climbing. Zermatt runs a highly efficient lift system that includes 74 transport facilities with high-speed cableways, mountain railways, and ski lifts moving 17,188 people per hour. This system also provides access to Cervinia, Italy, where visitors can ski down the slopes and enjoy a tasty Italian meal. Great restaurants are easy to find in Zermatt. The village is home to over 100 restaurants. 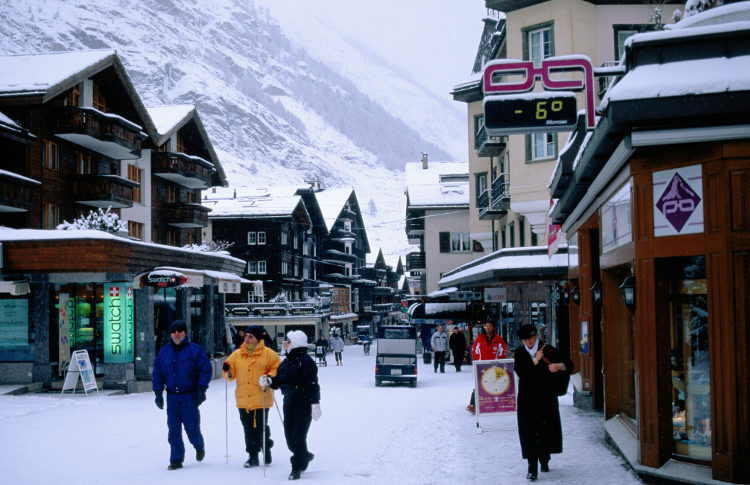 Many are located along the Bahnhofstrasse, Zermatt’s main street. Food served ranges from traditional regional dishes of Raclette and fondue to Chinese, Italian, and Japanese dishes, among others. The restaurant Le Mazot offers high-class dining while Tony’s Grotto is a great place to enjoy a pizza. There are 38 mountain restaurants, as well. Many diners move on to a bar or nightclub with entertainment ranging from jazz to disco. Skiing is not the only way to spend a day in Zermatt. Fun excursions include the Glacier Grotto, the world’s highest ice museum with its blue, frozen sculptures. A cable car lifts visitors to the top of the Klein Matternhorn to explore the unique glacial caves. Air Zermatt offers helicopter rides with stunning views of the Matterhorn and other nearby peaks. The Alpine Museum in Zermatt is also fun for winter sports lovers and details the history of mountaineering and skiing in the area. Shoppers are happy in Zermatt, as well. More than 300 shops sell products ranging from Swiss army knives to cuckoo clocks. Some shops sell touristy souvenirs while others offer designer fashions, ski wear, and expensive jewelry. For those who aren’t shoppers, there’s a very popular casino. Zermatt provides everything needed for the ultimate alpine vacation. 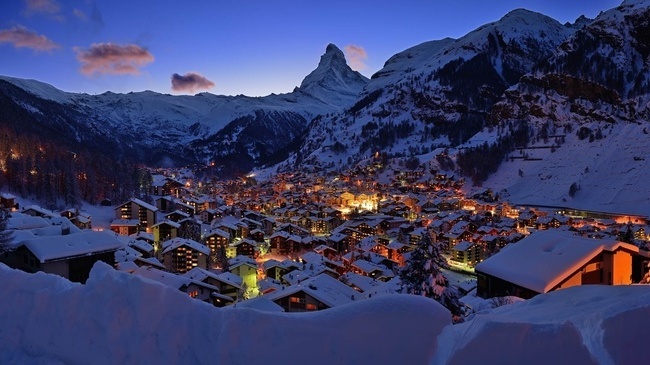 From a thrilling ski run to a cozy dinner in an old chalet, a Zermatt winter vacation is what dreams are made of.